Colorado cowboy and entertainer Gary McMahan is a walking page of American history. "Like horse manure, I've been all over the West, first with my Dad as he hauled cattle from Montana and the Dakotas to Texas and all points in between, then as a cowboy, and finally as an entertainer. For most of my life, I've somehow managed to make my living either with a horse or a guitar. I can remember when Ian Tyson, Chris LeDoux, and I were the only genuine cowboy types kicking around Nashville in the early seventies. All three of us were pretty much out of work, and it stayed that way for over a decade. But we all three hung and rattled and made it through that drought. I managed to extract myself from horse outfits and singing in windy little Naugahyde bars when the cowboy poetry gatherings came along. It was there that my audience and I found each other. Now I make my living performing at banquets and concerts. My guitar and I continue to travel the country 'spreading it around' and probably will 'til we both give out." Gary is the real deal. A native of Greeley, Colorado, he has made his living doing everything from cowboying to guiding to performing. He can brand, calve, rope, ride broncs, fence, hay, shoe horses, pack, and drive teams, and has won many honors in the rodeo arena. His colorful background has set Gary in good stead to practice his heart's desire: to write, perform, and record the stories, poems, songs, and humor of his Western heritage, becoming one of the most dynamic and sought-after writers and performers in his field. 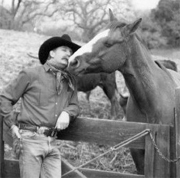 Gary's songs have been recorded by stars like Ian Tyson, Chris LeDoux, and Riders in the Sky. And, he has recorded six critically acclaimed albums himself. He has received the most prestigious award in Western music: a National Cowboy Hall of Fame Wrangler Award. Gary's poems have been published by the Cowboy Poetry Gathering in Elko, Nevada. 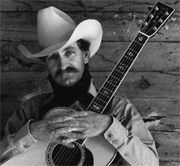 Sharing the stage with performers the likes of Doc Watson, Baxter Black, Ian Tyson, Riders in the Sky, and Chris LeDoux, he has played hundreds of cowboy poetry gatherings, banquets, festivals, and concerts throughout the U.S., Canada, and Australia.